Fig. 1 Configuration of rotating Poiseuille flow. Fig. 2 Visualization of instantaneous flow field at Reτ (= uτδ/ν) = 64 and Roτ (= 2Ωδ/uτ) = 0.02, in an (x, z)-plane. Red isosurface, u’/uτ> 3.5, blue, u’/uτ< –3.5, green, II’+ = u’i,ju’j,i < –0.015 (which is equivalent to the vortical position). The mean flow moves from left to right. Fig. 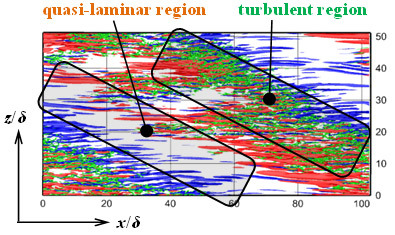 3 Diagram of the structure of turbulent stripe and the streamwise velocity. Red and blue region represents high- and low-speed regions, respectively. Orange and blue circle notes quasi-laminar and turbulent regions, respectively. Fig. 4 Visualization of instantaneous flow field at Reτ= 64 and Roτ= 0.015. (a) Red isosurface, u’/uτ> 3.5; blue, u’/uτ< -3.5, (b) Red isosurface, v’/uτ> 0.75; blue, v’/uτ< -0.75, (c) Red isosurface, w’/uτ> 1.5; blue, w’/uτ< -1,5. The mean flow move from left below to upper right. Reynolds, O., “An experimental investigation of the circumstances which determine whether the motion of water shall be direct or sinuous and of the law of resistance in parallel channels”, Phil. Trans. R. Soc., Vol 174 (1883), pp. 935-982. Avila, K., Moxey, D., de Lozar, A., Avilla, M., Barkley, D., and Hof, B. “The onset of turbulence in pipe flow”, Science, 333.6039 (2011), pp. 192-196. Tsukahara, T., Seki, Y., Kawamura, H., and Tochio, D., “DNS of turbulent channel flow at very low Reynolds numbers”, Proc. 4th Int. Symp. on Turbulence and Shear Flow Phenomena, Williamsburg, USA, Jun. 27-29 (2005), pp. 935-940.; Tsukahara, T., Kawaguchi, Y., Kawamura, H, Tillmark, N., and Alfredsson, P. H., “Turbulent stripe in transitional channel flow with/ without system rotation”, Proc. 7th IUTAM Symp. on Laminar-Turbulent Transition, IUTAM Bookseries, Vol. 18 (2010), pp. 421-426. 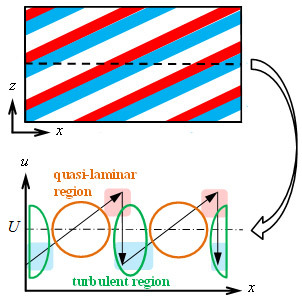 Prigent, A., Gregoire, G., Chate, H., Dauchot, O., and van Saarloos, W., “Large-scale finite-wavelength modulation within turbulent shear flows” Phys. Rev. Lett., Vol. 89 (2002), 014501. Brethouwer, G., Duguet, Y., and Schlatter, P., “Turbulent- laminar coexistence in wall flows with Coriolis, buoyancy or Lorentz forces”, J. Fluid Mech., Vol. 704 (2012), pp 137-172. Ishida, T., Tsukahara, T. and Kawaguchi, Y., “Large-scale structure alternation in rotating plane Poiseuille flow at transitional Reynolds number”, Progress in Turbulence V, A. Talamelli et al., eds., Springer (2014), pp. 177-182. Johnston, J. P., Halleen, R. M., and Lezius, D. K., “Effects of spanwise rotation on the structure of two-dimensional fully developed turbulent channel flow”, J. Fluid Mech. Vol. 56 (1972), pp. 533-557.